The Fistral Beach Micro Groms Club is for kids aged 5 – 7 years old who are looking to start surfing. Meeting once a week in July and August the sessions are 1.5 hours, all the equipment is provided. Fistral Beach Micro Groms Club aims to help build the water confidence of 5-7 year old’s, in a safe and fun environment. The Micro Groms Club has been designed specifically for children aged 5-7 years. 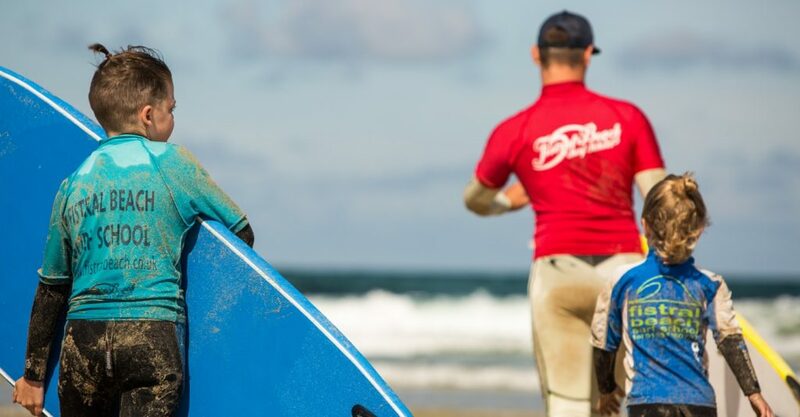 With a maximum of only 4 surfers to 1 instructor, the Fistral Beach Micro Groms Club ensures each child receives an extremely high level of supervision and instruction in the water. The beach and water sessions are a total of 1.5 hours. Covering a variety of topics from beach safety and sea awareness skills, alongside water skills. Fistral Beach Micro Groms Club offers a safe setting for each child to hone their water skills with a surfing instructor. On the first session the groms will be bodyboarding with their instructor, to build their confidence and learn how to catch waves. From here we have a huge selection of surfboards which have been sourced for their suitability towards the younger surfers. Fistral Beach Micro Groms Club is running throughout July & August on Sunday mornings. Meeting at Fistral Beach Surf School for 10.30am, the groms will then have time to get changed and catch plenty of waves to be back at the school for 12.30pm. Below are a list of the dates, all run from 11am-12.30pm. This includes all equipment, the groms will just need to bring along a towel and some swimwear. If your child loves the water, is a confident swimmer and would like to join our Micro Kids Club use the ‘book now’ button, contact us at FISTRAL BEACH SURF SCHOOL or phone us on 01637 850737. Does My Child Have To Attend Every Micro Groms Session? For Micro Groms sessions are purchased on a monthly basis; you can either buy a block for July or August at £70 (4 sessions), or for both months at £120 (8 sessions). Spaces on Micro Groms are limited so by purchasing a block your child gets one of the limited spaces for that period. It is entirely up to you whether you attend each session, but due to restricted spaces it would not affect the price of the membership. What Swimming Ability Does My Child Need For Micro-Groms? Fistral Beach Micro Groms has been designed for 5-7 year olds, we know that swimming ability does vary a lot at this age. We require that all the students have a basic swimming ability. If your child does not have water confidence or is a non-swimmer, then please discuss this with us before booking. What Should I Bring To My Surfing Lesson? Wondering what you should bring to your surfing lesson? Look no further! We provide all of the equipment which is needed for when you are in the water. We also have private changing rooms, lockers and offer access to the showers at the beach. Minimum Age For Surfing Lessons? The minimum age for surfing lessons varies depending on the type of surfing lesson you are having with us at Fistral Beach Surf School. In our group lessons the minimum age for surfing lessons is 8 years old. However, in our private surfing lessons children above 5 years old are welcome to either have a lesson alone or with their family as long as they have some water confidence. We have a groms club running weekly throughout the spring and summer where the minimum age is 8 years old. In our micro-groms club children are 5-7 years old.